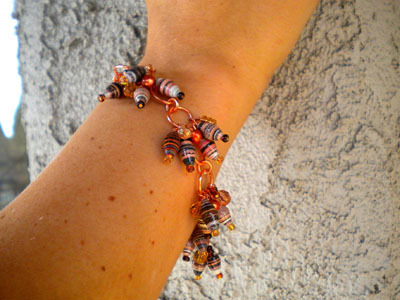 The cha-cha bracelet has become popular because it is such a fun piece of jewelry. 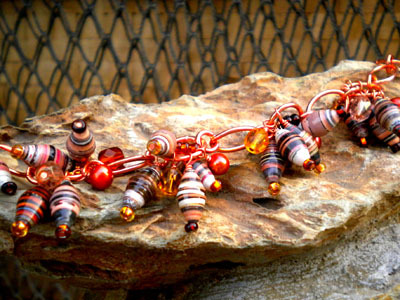 It is the child in each one of us who get mesmerized by the dancing beads and the tinkling sound. I prefer to call this the Shaker Bracelet because you cannot help but shake your hands just to watch the beads and charms dance on your wrist. 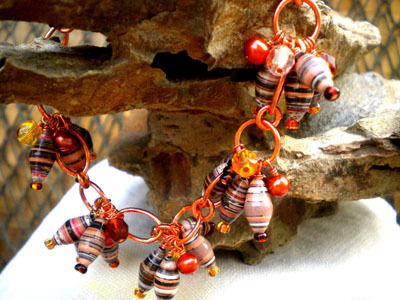 The brown color olive paper beads are mixed with copper glass pearls and dangles from copper chain. Kayla used the same technique as the Bunch Of Olives earrings we did from earlier post; you string a seed bead then paper bead into a head pin and make a loop at the end. You do the same thing with the crystals and pearls and to make it more fancy you can even add bead caps. What a beautiful bracelet!!! 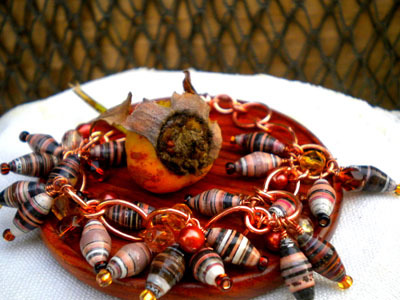 Amazing what can be made from paper beads!!! Very nice, I just sent my picture. Thanks!